In the Navy, Electrician's Mates (EMs) are responsible for operating a ship's electrical equipment. This includes electrical power generation systems, lighting systems, electrical equipment, and electrical appliances. These sailors may perform their work aboard ships or submarines or on equipment onshore installations. Wherever there are electrical parts for ships, these sailors will be needed. If you're someone with an affinity for repairing things and have experience with electronics, you'd be suited for this rating (what the Navy calls its jobs). These sailors are responsible for installation, operation, adjustment, routine maintenance, inspection, test and repair of electrical equipment. EM's also perform maintenance and repair of related electronic equipment. This can include everything from installing power and lighting circuits and repairing distribution circuits to running wiring for lights and other equipment. The job also entails maintaining operating efficiency of distribution panels, switches, switchboards, controllers, voltage regulators, current transformers and voltage transformers and electric motors. There's also a fair amount of repair work involved in this job; everything from repairing electrical equipment and appliances to maintaining and repairing shipboard elevator systems, propulsion controls, and auxiliary control systems. You'll install and maintain storage batteries, inspect and test electric power equipment, and connect electric power machinery and electric power equipment. You'll repair and maintain auxiliary control consoles, and interpret electrical sketches, diagrams, and blueprints. Most work in the EM rating is performed indoors, under varied conditions at sea and ashore. Work may be done in a shop-like environment. EM's do mostly physical work of a technical nature and usually work closely with other ratings. USN EM's are stationed primarily aboard USN deploying ships, Full-Time Support (FTS) EM's are stationed aboard Naval Reserve Force (NRF) ships that deploy or conduct local operations. There's likely to be loud noises and inclement weather conditions as part of this job. After technical school — also known a boot camp — at Great Lakes in Illinois, you'll spend another 12 weeks at Great Lakes for technical school. Before you get to boot camp, however, you have to take the Armed Services Vocational Aptitude Battery (ASVAB) tests. To qualify for this job, you need a combined score of 210 on the verbal (VE), arithmetic (AR), mechanical knowledge (MK) and mathematics comprehension (MC) sections of the ASVAB. There's no Department of Defense security clearance needed for this job, but you will need normal color perception. Promotion opportunities and career progression in the Navy are directly linked to a rating's manning level at the time you enlist. This is a sea-intensive community. Manning conditions at sea may require the need to request sea tour extension or shore tour curtailments to ensure all sea duty billets are filled. What Is a Navy Boatswain's Mate? What Are the Typical Duties of Navy Logistics Support? What Is a Navy Aviation Aerographer's Mate (AG)? 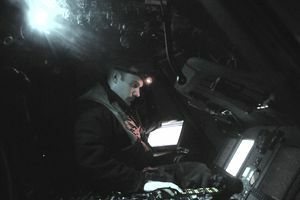 What Do Navy Cryptologic Technicians Do? What Are the Responsibilities of a Navy Engineering Aide?